We, the National TRUTH Council of 2017-18, draft this document in the radical tradition of creating manifests in order to define our revolution and achieve liberation. 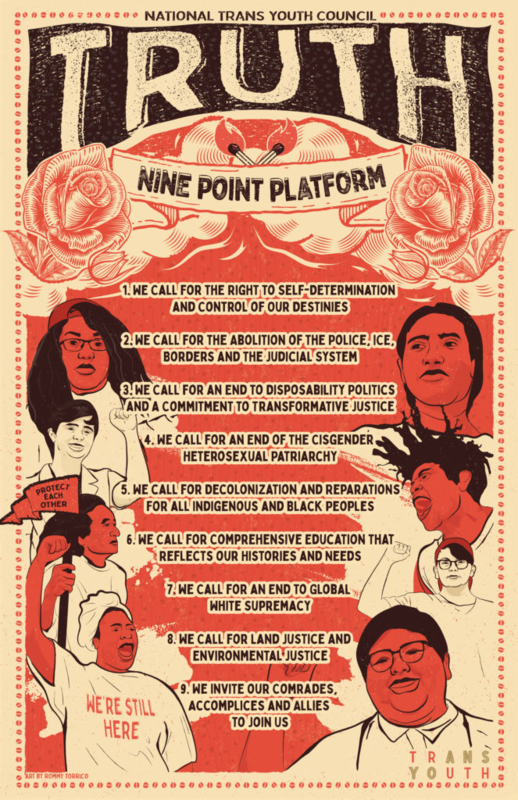 The manifesto was inspired by and builds upon the Black Panther Party’s Ten-Point Program, the Young Lord’s 12 Point Program and Platform, and the Third World Gay Revolution. The manifesto is not a static document, but a living one, so that it may be updated and changed to reflect the council’s increasing understanding of the systems of oppression and the changes in the language we use to describe both ourselves and these systems. We are in a moment which calls for us to bravely and ferociously fight for our communal liberation. In this moment, in the name of our transgender and gender nonconforming ancestors who struggled before us, in our blood, bones, and our spirits, we claim our right to existence and our future victory with these frameworks to guide our own work and the work of future generations on our collective, continuous journey towards liberation. We as trans youth have the right to control our narratives, spaces, and all aspects of our lives. Resources to achieve this trans empowerment must be made more readily accessible and available. We demand abolition! Abolition of the police, abolition of borders and ICE, abolition of the current punishment-based justice system. We demand for our communities to be empowered to take care of themselves, for no borders, for rehabilitation and healing justice. Abolition is a process that we are committed to fight for. We believe in establishing a culture of accountability that is transformative in nature and creates opportunity for growth. We must take responsibility and hold space for the collective wellbeing and unity of our people. We recognize that the current state of the world centralizes the stories of white cisgender heterosexual men. We call for the end of a social structure that separates or determines the value of people on gender expectations from historical Europe. We demand that queer and/or TGNC people no longer be oppressed by these frameworks, institutions, and their enablers. We call for the payment of reparations that are owed and the reclamation of cultural practices by the communities from which they originated. We call for the active and complacent perpetrators of cultural appropriation and colonization to be held accountable and to recognize the privilege they maintain through the oppression of others. We call for the use of informed educational practices that provide access to curriculum to help build opportunities for historically erased peoples. We call for free and non-compulsory education for all ages and for all access levels. We call for the end of this racist system that profits off of the devaluing of Black people, Indigenous people and all other people of color. We believe in exposing the history of global white supremacy and it’s discriminatory practices. We call for the recognition and Indigenous reclamation of stolen lands. We call for conscious creation through choosing to stay local and sustainable, remembering that our actions last for generations. We invite our comrades in struggle who align with our principles, including those who have yet to self-determine their relationship to the struggle, to join us in solidarity, coalition, and liberation — remembering the revolution is a relationship.